Home » Blogger Tips » Remove Or Hide Footer Link From Blogger Templates | फ्री ब्लगर टेम्प्लेटको फुटर क्रेडिट लिंक कसरी हटाउने? Remove Or Hide Footer Link From Blogger Templates | फ्री ब्लगर टेम्प्लेटको फुटर क्रेडिट लिंक कसरी हटाउने? Hello Namaste and Happy New Year 2074. After a long, I am back again with an interesting topic. Yeah! Today I am going to give you some tips/tricks to Remove Footer Credit Link from your beautiful blogger templates; i.e. obviously from the awesome free templates. We see lots of cute, impressive and professional templates are available on the web in free of charge. But in the footer of the blog, you may notice that the template creator placed a credit link for their website. You can see mine too "Publish by Mas Sugeng". Most of the Template (or Theme) Designers keep a secret id (like 'mycontent') to their designed template for not to be pirated. Because template Designers had put their hard works to build a single template. So, personally I would suggest not to remove author credit link. Please pay some respect. Well, I understand some of you may not want the footer credit links. Because if you try to remove them, then the site is automatically redirected to another site that is very irritating ... Doesn't it? So, we can't use many of them because of this footer credit link. Don't worry! Hereafter you can use any free templates you want without templates owner's footer link. You basically have 2 choices ... Either you can Hide the Credit Links or you can Remove it Permanently from the blogger templates (themes). Step No. 1: Go to Blogger Dashboard>Template>Edit HTML. Step No. 2: Use (CTRL + F) and search any of the following words within your html code. Step No. 4: Now press on "Save template". That's it, you are done. You hide the footer credit link from your awesome template. Step No. 2: Use (CTRL + F) and search the code provided below within your html code. Step No. 4: Now Search the word "mycontent" and change that word like The SEO Feed (your domain name). Step No. 5: Now change the Credit Link as you wish and click on "Save template". You are done now. 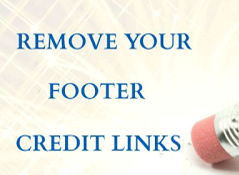 The footer has been permanently removable and you can put the Credit of your own. Cheers! I hope you understand above 2 Ways to Hide Or Remove Footer Link Permanently from the Blogger Templates ... If you have any difficulties, don't hesitate to ask me. Or you can use the comment section below to drop your ideas, responses, difficulties, etc. Otherwise, use contact form. Cheers! 0 Response to "Remove Or Hide Footer Link From Blogger Templates | फ्री ब्लगर टेम्प्लेटको फुटर क्रेडिट लिंक कसरी हटाउने?"